Writing is a crucial part of being a creative professional. Cullen’s writing experience includes step-by-step technical instructions, scripts for marketing campaigns, greeting cards and web content. CRAFTBEER.com - Georgia’s craft beer awakening came a little later than most places. When Orpheus Brewing opened its doors on Memorial Day 2014 there were less than 35 breweries in the entire state. At the time, tart beers were still relatively unknown to the average Georgia beer drinker. In the two short years since then, the status of Georgia-brewed sour beers has changed dramatically and Jason Pellett, brewmaster at Orpheus Brewing, deserves a lot of the credit. CRAFTBEER.com - Turkey may get all the glory on Thanksgiving but it’s the holiday side dishes that steal our hearts. A Thanksgiving inspired beer pairing dinner party matches craft beer styles with classic Turkey Day trimmings. Our seven-course meal includes everything but the bird. The suggested pairings are based on both traditional holiday flavor combinations and the science of balancing flavor profiles (sweet, sour, bitter, salty and umami/savory). With so many beers on the menu, smaller pours (3 to 6 oz.) will keep guests from passing out in the pie. CRAFTBEER.com - Holy City Brewing emerged from the garage of a bicycle shop where one of the four founders, Joel Carl, had used his spare time to turn bike necks, handle bars and scrap metal into a three burner, 15-gallon, all-grain pilot system. That system combined with the right mix of friends — one with professional brewing experience, another with available warehouse space — and a city developing a thirst for more craft beer options resulted in a Charleston brewery rooted in local awareness. ULTIMATEPATIO.com - In the early 18th century formal geometric gardens gave way to rambling, natural looking gardens. The new style, known as English landscape, aimed to create picturesque, idealized versions of nature. 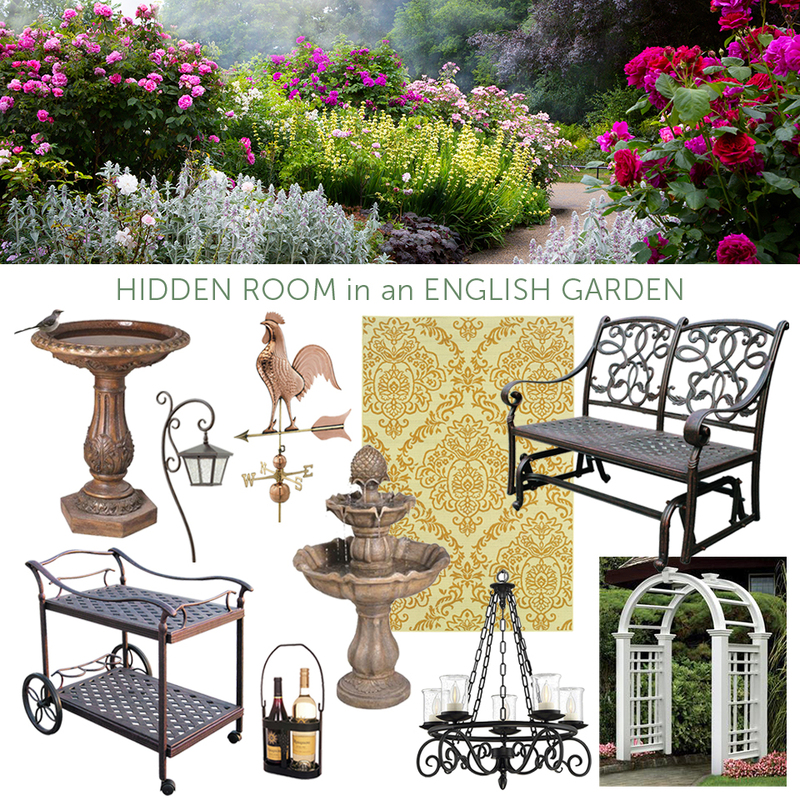 Today these gardens serve as inspiration for creating an intimate, formal but fun, outdoor room. To make a hidden outdoor room, start with elements that create privacy: arbors woven with climbing vines, walls of hedges and beds of towering flowers. Add decorative outdoor carpets and furniture. Combining a rug featuring a traditional damask pattern with furniture composed of whimsical scrollwork creates an atmosphere that feels both formal and fun. Delicate with filigree-inspired lighting fixtures will echo the scrollwork patterns. Complete the feeling of refuge and intimacy with partially hidden birdbaths, bird feeders, weathervanes and garden fountains. CullenBoudreaux.com - Five years ago I was introduced to a boisterous Grant Park neighbor named Tom Houck. My [then fiancé] and I began to run into him often, usually at our next door neighbor's house or our favorite local pub, Augustine's. When Tom asked what we wanted as a wedding gift I thought for a moment and said "a personal tour of the Civil Rights Movement in Atlanta from you". (This post originally appeared in my personal blog - And Topher Too). • 1836 - The Western and Atlantic Railroad plans a route to connect Savannah to the Midwest. The initial track runs from Chattanooga to a spot near the Chattahoochee - this spot is marked as "mile post zero". The community that grows up around it becomes known as "Terminus" aka "the end of the line". John Thrasher is hired by the Western and Atlantic Railroad to develop the area's first homes and a general store for railroad workers. The community takes on his name: Thrasherville. 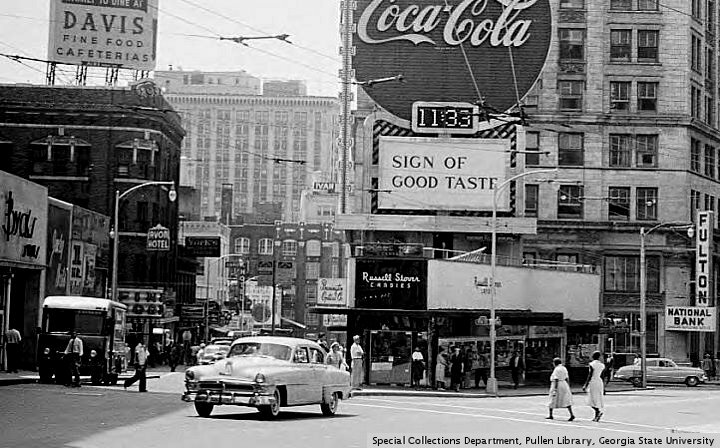 (Current day: Marietta Blvd across from Fairlie-Polar District). • 1842 - Terminus/Thrasherville is renamed "Marthasville" after Governor Wilson Lumpkin's daughter, Martha. When Martha Lumpkin dies in 1917 she is buried in the original 6 acres of Oakland Cemetery. • 1845 - A chief engineer of the Georgia Rail Road suggests renaming the city "Atlantica-Pacifica" (presumably referencing: from the Atlantic to the Pacific). • 1847 - "Atlanta" officially becomes Atlanta. • 1864 - Battle of Atlanta. Battle lines follow current Moreland Avenue south from the Edgewood shopping center to I-20 where they make a 90 degree turn towards the west. Sherman burns an estimated 3,200 to 5,000 buildings - sparing about 400. Lemuel P. Grant's home is spared because of the Masonic paraphernalia found on the property. • 1865 - Civil War ends, Atlanta begins rebuilding. • 1880 - Atlanta's population hits 37,500. It is the largest city between Richmond, Virginia and New Orleans, Louisiana. (Note: Turner Field's current capacity is 50,000). • 1882 - Lemuel P. Grant donates 100 acres of his land for the formation of Grant Park and the surrounding neighborhood. Today the neighborhood is home to most of Atlanta's original Victorian architecture. • 1889 - A traveling circus goes bankrupt and abandons it's animals in Grant Park. Zoo Atlanta is formed. • 1893 - Lemuel Grant dies in the overgrown Victorian home at the corner of Sydney and Hill St.
• 1902 - Golf legend Bobby Jones is born in the master bedroom of Grant Lemuel's first home. • 1940s - Margaret Mitchell starts a campaign to save the Grant mansion but is cut short when killed by a taxi on Peachtree at 13th Street. • 1960's and 1970's - Interstates 75/85/20 separate Grant Park from the rest of Atlanta. BBQGUYS.com - When New Jersey interior designer, Elizabeth Ruffalo, started renovating her home the backyard was nothing but dirt and weeds. Playing with the idea of an outdoor kitchen she began researching options online and discovered BBQGuys.com. Liz was satisfied that BBQGuys offered the quality and style she needed to bring her creative vision to life. With experience in both engineering and design, Liz jumped into the outdoor kitchen planning process. Her work as in interior designer at an Architectural Digest Top 100 Firm in SoHo gave her a discerning eye for trends in color and texture. Her experience as engineer working with architects and contractors gave her the practical experience to draw up elevations. With a solid plan in place she turned to Pflueger Landscaping for help with construction and landscaping. The final design features a Blaze LTE 40-Inch 5-Burner Built-In Natural Gas Grill With Rear Infrared Burner & Grill Lights, a double side burner, outdoor compact refrigerator, outdoor sink and outdoor kitchen storage. The BBQ island’s elegant counter tops are made of Pietra Cardosa stone with ceramic tile cladding that has the look and charm of real wood. The patio is paved with Belgard Provence slabs and edged with 6” x 6” blocks in a contrasting texture. String lights, ferns and hydrangea made the backyard makeover complete. CullenBoudreaux.com - My interest in General John Hood can be pinpointed to one historic marker in Oakland Cemetery (high five to Roman Mars/99% invisible - "always read the plaque"). It said something along the lines of "it was here that General John Hood watched the burning of Atlanta from the second story window of a [future Atlanta mayor's] home". 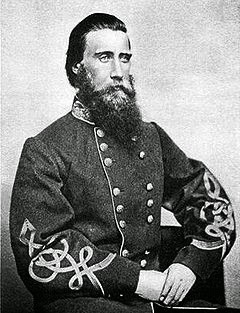 At the time of reading I knew enough to think: why is the man in charge of defending Atlanta during Sherman's raid watching from a second story window a couple of miles from the action!? The answer is so much better (and more complicated) then I could have imagined. Read on!